There’s only one way to describe Anna’s vision for her wedding day, and I’ll sum it up using her words because I think she summarises it beautifully. “Midsummer’s Night Dream meets Pride and Prejudice” topped off with a bridal headpiece inspired by “Elven from Lord of the Rings”. Amazing huh? In fact, I don’t think the word ‘amazing’ does her vision justice! Learning about Anna’s unique vision and all the gorgeous details was like reading a script from a Hollywood movie. Gorgeous wreaths of foliage hanging from the beams in the ballroom where the reception will be held, wild and organic flower centrepieces across the tables and in bouquets… a stunning wedding dress that I can’t even begin to describe and everything sprinkled with splashes of whimsy, elegance and a whole lot of love for all things ethereal and majestic. 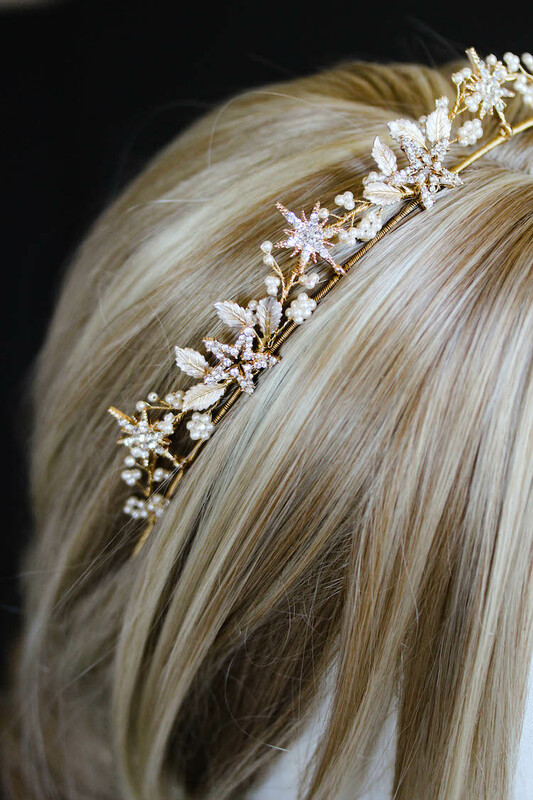 Anna had her heart set on a golden bridal headpiece featuring textured leaves and organic details, no flowers as such or shimmering rhinestones but instead, something more twig-like piece in appearance. A piece which she could position from behind as a ‘backwards tiara’ that will gracefully frame her 4 metre long cathedral length veil as she walks down the aisle. We were both bursting with ideas and went back and forth exchanging inspiration over many emails. I could have easily gone on for much longer; it was always a pleasure chatting to Anna! I loved creating this bespoke bridal headpiece because I love being able to help bring someone else’s vision to life. I refuse to accept that only some of us have creative bones in our bodies… we all do and that’s what makes us all unique snowflakes. Our vision is a reflection of our own personal story, the journeys we’ve all gone through to get to where we are now and the experiences and people who have touched us along the way. No one can replicate that and nor should they. And I can’t think of a better time than on a wedding day to pull that vision to life and to capture all it is that makes you who you are.